Now compared to some of our other projects Codename: Furiosa was rather short lived, only about a month of development time went into it all in all. The developer team spent most of the time looking into car physics (which turn out to be much more complicated than you would think!) while Simmi brainstormed character designs and game mechanics. The core theme was “What if Death Race 2000 had streamers?”. Every competitor out there would be clamoring to increase their viewership rating and getting out alive. 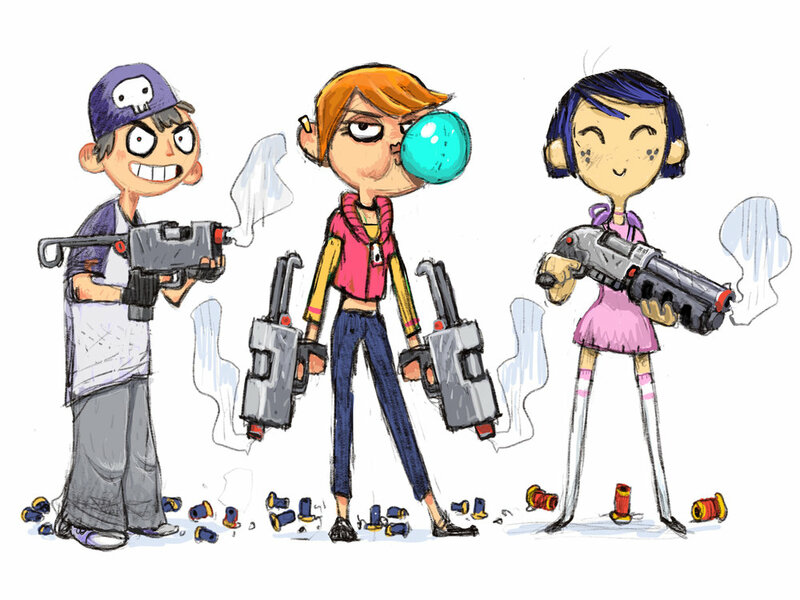 First iteration of the game’s character designs. The basic game-play loop we originally came up with. Simmi drew this up as a idea summary sheet. We thought about vertical vs horizontal maps. Do you continually need to move up the ramps here towards the top instead of towards a center? A more horizontal type of battlefield design. A) We didn’t really have the networking know-how at the time to pull this off. B) Car physics are way harder then you think they are. C) None of us is actually interested in developing racing games. If you don’t want people to use your house as a ramp Mr. Griffin, then why did you build it that way?